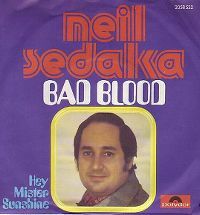 Neil Sedaka wrote some great songs, but "Bad Blood" is not one at the top of my list. 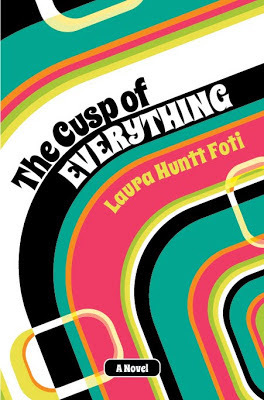 In Cusp I have it playing in the background during a conversation between Karen and Craig: "Sunday I call Craig to wish him a safe trip back to Syracuse. I can hear Neil Sedaka's annoying 'Bad Blood' in the background as he says hello, and it immediately puts me in a bad mood." After a decade off the charts, by the mid-'70s Sedaka's career had moved from performing to songwriting. Thinking he was ripe for a comeback, Sedaka fan Elton John signed him to Rocket Records in 1973. The title of his next album, Sedaka's Back, proved prescient, as "Laughter in the Rain" hit number one in 1975. His second Rocket album, The Hungry Years, spawned the number-one hit "Bad Blood" in October that same year. A remake of his early '60s hit "Breaking Up Is Hard to Do" followed shortly on its heels. That song appears in a later Cusp chapter.